voila, you’ve let them in without having to leave your apartment and going all the way downstairs. the locked building door by controlling the electric strike. with most lock sets, and is a powerful security system when used in conjunction with access control devices like magnetic locks and electric latches. to use the door knob or handle. If the electric strike is ‘open’, you can open a door just by pushing it. The latch or bolt can stay in its extended position. If you own a store or an office, people don’t have to keep turning a doorknob to come inside. In case of fire, electric strikes keep doors open for easy, life-saving exits. inside and the air conditioning out. In business, you control which doors the public and your trusted employees can access, and when. A school kitchen and dispensary won’t be accessible to kids because only the staff know the code for the doors. Stockrooms can be kept open while the stocking happens-- and locked with limited access the rest of the time. As for security, an electric strike is impenetrable when used with a magnetic lock. The electric strike is an essential element of security, keeping the lock in place. How does an electric door strike work? the lock set so we can open a door, because otherwise the door strike holds the latch bolt in place. to open without manual retraction of the latch bolt. The latch just rests in the electric strike. When you lock the electric strike, the keeper holds the latch in place. The bolt or latch has to be set in dead-lock: permanently extended and can’t be pushed back. Most lock sets work with an electric strike, although you may need to install a new lock set to suit your purposes. Your choice of electric strike depends on the lock you’ve got. If you’re also changing the lockset, your choice depends on the door’s type and purpose. lockset to a deadbolt in addition to the electric strike, or perhaps to a better cylindrical lock, at least. What type of lockset have you got? information about that product. You would recognize these types of locks in your home or business. Rim exits are often used in steel/wrought iron gates and in panic exits, while cylindrical, mortise and deadbolts are common in homes and places of business. Each type of lockset has its corresponding electric strike. What type of door is it? Single? Double? What’s the door material and the dimensions of the locks? 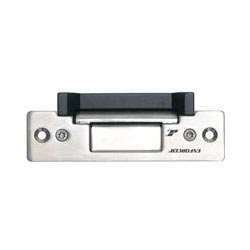 magnetic shear locks or double action electric latches. There are strikes suitable for nearly all door styles and materials, from timber, steel, aluminum to even the problematic uPVC. the “holding force,” for different levels of security. But even those labeled “light” are strong enough, with 1200lb holding force. Depending on your security requirements, and how much usage your doorway will have, you’ll need door hardware and electric strikes all with the same grading. Grade 1 is the highest-- strikes and hardware go through cycle testing and static and dynamic strength testing to determine their grade. with the lowest grading. Your whole entryway is dragged down by its weakest point. See below for details on the grading for electric strikes. Would you need to monitor the lock/strike? What power supply unit (PSU) is available (AC? DC? ), or what would you install? AC voltage is only available for fail secure. It makes the familiar “buzz” sound when the power is activated. Fail safe units are always run under DC power. make a click when opened. If you want the buzzing sound, you can install a buzzer. what else is using the same PSU. Electric strikes have two configurations, fail-secure and fail-safe. New technology has made it possible for rapid switching between the two. default, the strike in a locked position. keys, codes, cards or buttons operated by authorized people, i.e., you and your neighbors if you’re in an apartment building. without needing keys or access codes and cards. Electric strike vs. magnetic locks? There’s some confusion about electric strikes and magnetic locks. There should be no ‘versus’ between them. They work together. Without power, the door opens. This is where an electric strike comes in. A fail secure electric strike would keep a door locked even when the power goes out. control setups is an electric strike and an electromagnetic lock together. performance and durability levels of your electric strikes are up to the standards they’ve established. When you look at locksets and electric strikes, you’d see Grades 1, 2 or 3. Grade 1 is the highest. for specific instructions for your specific electric strike. 1. Make sure you've made the right choice for the purposes of your electric strike. See the selection how-to in this guide. Is your chosen electric strike strong and durable enough? Is it a match for the lockset, whether it's an existing or a new one? If you have double-doors, is the mullion or inactive door a good fit for the strike? Do you have the correct voltage from your power supply? What does your application need, fail secure or fail safe? Have you picked the matching strike? make sure you get everything you need for the installation. 3. Gather your tools together. reciprocating saw - for use if you have a hollow metal and aluminum frame; a power saw with a blade that alternates between forward and backward movement. 4. Mark off the dimensions needed in the door frame. anatomy of your electric strike. good distance from the strike cutout and a good space to be strongly anchored to the wood. There are electric strikes for this specific application. a larger gauge to avoid voltage drops and problems with your electric strike. Double check and triple check that you’ve got the correct specifications for your PSU and voltage. Exceed the required current and amperage with a margin of 20-25% to make up for voltage or current loss due to conduction. Fail secure electric strikes are commonly in an open switch configuration, since the strike is locked without power. The circuit closing unlocks the strike. when the circuit is opened. instructions and other data sheets. In case it’s not there, the brand and series guide below has links to the official pages from their own websites. HES 1006 Series instructions and dimensional drawings, download here. HES 4500C Series instructions and dimensional drawings, download here. HES 5000 Series instructions and dimensional drawings, download here. HES 5200 Series instructions and dimensional drawings, download here. HES 7000 Series instructions and dimensional drawings, download here. HES 7501 Series instructions and dimensional drawings, download here. HES 8000 Series instructions and dimensional drawings, download here. HES 8300 Series instructions and dimensional drawings, download here. HES 8500 Series instructions and dimensional drawings, download here. HES 9400 Series instructions and dimensional drawings, download here. HES 9500 Series instructions and dimensional drawings, download here. HES 9600 Series instructions and dimensional drawings, download here. HES 9700 Series instructions and dimensional drawings, download here. For more details on the HES electric strikes, go here. To browse the HES electric strikes on JMAC.com, go here. Folger Adams 310 Series instructions and dimensional drawings, download here. Folger Adams 310-4 Series instructions and dimensional drawings, download here. Folger Adams 310-4-X Series instructions and dimensional drawings, download here. Folger Adams 310-6 Series instructions and dimensional drawings, download here. Folger Adams 700 Series instructions and dimensional drawings, download here. Folger Adams 742 Series instructions and dimensional drawings, download here. For more details on the Folger Adam electric strikes, go here. To browse the Folger Adam electric strikes on JMAC.com, go here. Available with two monitoring signal switches which sense whether latch bolt is in strike and whether strike jaw is blocked. Choice of mounting in AC and DC for intermittent or continuous duty. 7100 Electric Strike (flat faceplate) available with extended strike lip. Specify assembled for either fail-secure (locked when unpowered) or fail-safe (locked when powered) operation, but can be field converted to the other mode. 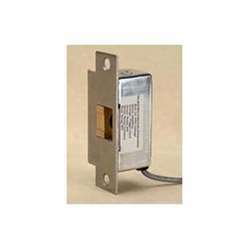 4605 Transformer – converts 120VAC to 12/24 VAC. Rated 40 Volt-amp output assures plenty of power for strike release. Patented mounting bracket fits in knockout hole of standard junction boxes. Adams Rite 7100, 7101 Electric Strikes instructions and dimensional drawings, download here. Choice of voltage in AC and DC for intermittent or continuous duty. Model 7110 and 7111 are identical except for their faceplate length. 4605 Transformer – converts 120VAC to 12/24 VAC. Rated 40 Volt-amp output assures plenty of power for strike release. Adams Rite 7110, 7111 Electric Strikes instructions and dimensional drawings, download here. 7130 (flat faceplate) available with extended strike lips. Adams Rite 7130, 7131 Electric Strikes instructions and dimensional drawings, download here. 7140 Electric Strike (flat faceplate) available with extended strike lip. Adams Rite 7140 Electric Strikes instructions and dimensional drawings, download here. Adams Rite 7160 Electric Strikes instructions and dimensional drawings, download here. Adams Rite 7170 Electric Strikes instructions and dimensional drawings, download here. UL10C, CAN/ULC-S104, fire rated 3 hr. Strike Lip: Basic 7240 strike has lip of proper length for 1-3/4” thick door that closes flush with jamb edge. Strike Opening: 5/8” x 1-7/16” x 9/16” deep. Bolt retainer jaw and strike lip are stainless steel. Strike accepts bolt from a variety of latchsets. Faceplate: Measures 1-1/4 x 4-7/8”. Faceplate is flat, with square corners. Assembled for fail-secure (locked when unpowered) operation. Strike Lip: Basic 7270 strike has lip of proper length for 1-3/4” thick door that closes flush with jamb edge. Strike Opening: 3/4” x 1-7/16” x 5/8” deep. Bolt retainer jaw and strike lip are stainless steel. Strike accepts bolt from a variety of latchsets or mortise panic exit devices when it is centered on strike. Faceplate: Measures 1-1/4” x 4-7/8”. Faceplate is flat, with square corners. Voltage: Available in 12 or 24 volt AC and DC. DC continuous units are silent, AC intermittent units “buzz" on operation. Adams Rite 7270 Electric Strikes instructions and dimensional drawings, download here. For more details on the Adams Rite electric strikes, go here. To browse the Adams Rite electric strikes on JMAC.com, go here. Alarm Controls AES-100 Electric Strikes instructions and dimensional drawings, download here. Alarm Controls AES-200 Electric Strikes instructions and dimensional drawings, download here. For more details on the Alarm Controls electric strikes, go here. To browse the Alarm Controls electric strikes on JMAC.com, go here and here. 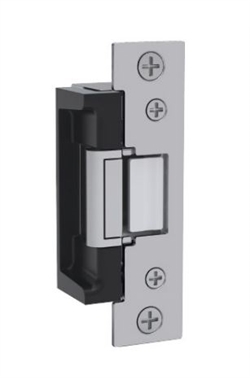 The SDC 15 Series electric strike is designed for use with cylindrical or mortise locks with 5/8" latch, or up to 3/4" latch with 1/8'' door gap. All stainless steel parts. Datasheet and Installation, download here. The SDC 25 Series electric strike is designed for use with cylindrical and mortise locksets with up to ⅝" (15mm) throw latchbolt. The compact low profile design with an internally mounted solenoid and factory supplied mounting tabs enable quick and easy installation where jamb space is limited. The heavy duty construction makes the 25 Series ideal for high traffic installations. 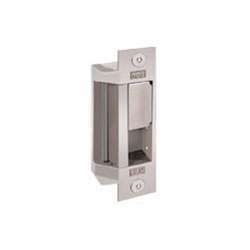 The SDC 30-4 Series electric strike is designed for use with rim mount exit devices having pullman type latchbolts. Options: Failsafe; Latch monitor; Locking Cam Monitor; Rectifier for AC operation. For more details on the SDC electric strikes, go here. To browse the SDC electric strikes on JMAC.com, go here. For use with the Yale Squarebolt ® or Corbin Russwin Securebolt ™ in new or replacement installations with wood or metal door frames. This is a Grade 1 Strike -- 3/4” thick Surface Mount that comes with a 1/8” Spacer. The 4200 has the tallest cavity in its class. This added height solves door sag and other alignment problems.problems. The Outdoor gate solution comes with the gatebox. It handles Cylindrical and Mortise Locks, like the 400, and comes with the Latch so it can be used with Rim Panic Exit Devices, like the 400RP. Superior Strength -- 2,000+ lbs UL® tested. Superior Application - Outdoor UL® rating allows the strike to be used anywhere - especially good for gates. Fail secure/Fail safe field reversible on DC units. Grade 1 Strike -- Contains a one piece locking mechanism with one Solenoid -- less parts mean less problems. Left and Right handing is field reversible. For use in new or replacement installations in wood and metal jambs. For use with locksets having up to 5/8” throw, based on 1/8” door gap. For use in new or replacement installations in wood and metal jambs Auxiliary lever ramps, or use with locksets which contain dead locking levers. Use with locksets having up to 5/8” throw, based on 1/8” door gap. For surface mount installations, on wood or metal jambs, for in swinging applications with surface mount. 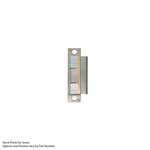 Use with locksets and night latches having up to 5/8” throw, based on 1/8”door gap. When mounted on a pair of doors, strike is mounted to the inactive leaf. For new or replacement installations in wood jambs. Use with locksets with individual deadbolts. Dead bolts cannot be released electrically. Use with locksets having up to 5/8” throw, based on 1/8” door gap. For use in replacement installations in wood jambs and iron gates. Use with bored cylindrical locksets having up to 5/8” throw, based on 1/8” door gap. HD005 - Screwed-on Faceplate and heavy duty latch pin provided for additional strength! For use in replacement installations in wood jambs and iron gates. Use with bored cylindrical locksets having up to 5/8” throw, based on 1/8” door gap. This heavy duty light commercial electric strike is a step up from the standard 005 model. For use in replacement installations in wood jambs and iron gates. Use with bored cylindrical locksets having up to 3/4” throw, based on 1/8” door gap. For surface mount installations on metal or wood jambs, for in-swinging applications. 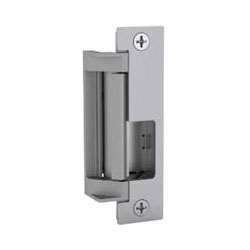 Use with locksets or night latches having up to 5/8” throw, based on 1/8” door gap. When mounted on a pair or doors, strike is mounted to the inactive leaf. For use in new or replacement installations in wood jambs. Use with locksets having up to 3/4” throw, based on 1/8” door gap. For new or replacement installations in wood jambs. Use with locksets having up to 5/8” throw, based on 1/8” door gap. For use in new or replacement installations in wood and metal jambs. Auxiliary lever ramps for use with locksets which contain dead locking levers. For use with locksets having up to 5/8” throw, based on 1/8” door gap. Allows adjustment for wider latch bolts & poorly aligned doors & locksets. 500,000 Life Cycles -- Holding Force - 900 lbs. 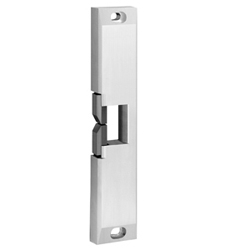 Solid Cast Latch - Chrome Plated. For use in new or replacement wood or metal jamb installations with locksets having up to 5/8” throw, based on 1/8” door gap. For use in new or replacement aluminum or hollow metal jamb installations. Auxiliary lever ramps for use with locksets containing dead-locking levers. Use with latch bolts having up to 5/8” throw, Based on 1/8” door gap. For use in new or replacement aluminum or hollow metal jamb installations. Auxiliary lever ramps for use with locksets containing dead-locking levers. Use with locksets having up to 5/8” throw, based on 1/8”door gap. For use in new or replacement installations in metal jambs. Fits a standard 4-7/8” ANSI prep with little jamb modification. Use with locksets having up to 5/8” throw, based on 1/8” door gap. For use in new or replacement installations in metal jambs. Centerline of the latch is 3/8” below ANSI centerline for offset applications. Fits a standard 4-7/8” ANSI prep with little jamb modification. Use with locksets having up to 5/8” throw, based on 1/8” door gap. For use in new or replacement, aluminum or hollow, metal jamb installations with locksets having up to 5/8” throw, based on 1/8” door gap. For use in new or replacement, aluminum or hollow metal, jamb installations. Auxiliary lever ramps for use with locksets containing dead-locking levers. Useful when converting an MS Lock to a dead latch. Up to 5/8” throw, based on 1/8” door gap. For more details on the TRINE electric strikes, go here. To browse the TRINE electric strikes on JMAC.com, go here. "Saw-tooth Adjustment Locator" design that allows the installer to move the deadbolt keeper, or plug and deadlatch ramp vertically to align with a wide variety of mortise locks with offset latches. There's no need to order special faceplates, you can adjust the strike to work with virtually any mortise lock type. AC/DC input acceptable for all fail locked models. For more details on the Rutherford Controls electric strikes, go here. To browse the Alarm Controls electric strikes on JMAC.com, go here. For more details on the ROFU electric strikes, go here. CX-EL0051 economy strike for cylindrical locksets, 9/16” (14.3 mm) max. latch projection. 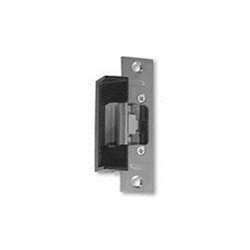 • Accommodates all Pullman type latches with up to a 3/4" throw. For more details on Camden Door Controls electric strikes, go here. To browse the Camden Door Controls electric strikes on JMAC.com, go here. The 6100 Series Strike offers a variety of highly customizable features. It is well suited for new construction applications. Its heavy duty stainless steel construction is fully UL1034 and UL10C listed and ANSI/BHMA Grade 1 1500 lb. hold force rated. • Power Failure Mode: Specify fail secure or fail safe at the time of order (note: fail safe should not be utilized on fire labeled doors). The 6300 Series Surface Mount Strike is ideal for aftermarket applications. It is easy to install without modifying or altering the door frame. The 6300 Series is UL1034 and UL10C listed. The 6200 Series Strike offers a variety of highly customizable features. It is well suited for new construction applications. Its heavy duty stainless steel construction is fully UL1034 and UL10C listed and ANSI/BHMA Grade 1 1500 lb. hold force rated. The 5100 Series is easy to install and comes standard with three face plates in every box. It is ANSI/BHMA 156.5 Grade 1 and UL1034 certified. The flexible design of the 6400 Series is ideal for aftermarket applications. Vertical adjustment up to 1/8” of the deadbolt keeper or deadlatch ramp allows for alignment with a variety of mortise locks with offset latches. The 6400 Series is UL listed for 1500 lb. static strength, UL 1034 burglary-resistant listed & UL 10 C 3 hour fire-rated (fail secure only). For more details on the Von Duprin electric strikes, go here. To browse the Von Duprin electric strikes on JMAC.com, go here. Cause: No power or incorrect voltage used. Confirm that you have the correct input and output voltages. Use a multimeter. Confirm that all connections are good and secure. Confirm that the keeper works fine when the door is open. Adjust the door or strike. Check the strike cavity depth matches the lock set's bolt or latch. Cause: Warped or sagging door. Lock is not dead latching. Cause: Improper installation or warped/sagging door. Solution: Adjust or replace the door. Fix the alignment or the horizontal adjustment of the deadlatch and the lip. Strike makes a buzzing sound or does not buzz. Solution: Match the proper AC (for buzzing) and DC (for silent) power supply. Or install a buzzer. Burnt smell coming from insert. Cause: Improper voltage and/or improper installation. Fix all connections tight and secure. Make sure you're using the correct voltage and connectors.